Consul-at-Arms points out that the phrase "Stone Cold Professional Diplomats" would make a great name for an in-house State Department rock band. I agree. Good instincts, CAA. I've checked and found out that some variation of that name is already being used by at least two groups (this one and this one) as well as in the title of a song by Queen (Stone Cold Crazy) that was later covered by Metallica. Since I know there must be lots of FSO garage bands out there somewhere, here are a few suggestions for names no one has taken yet. The Office of Foreign Missions, an organization that monitors, licences and polices all alien diplomatic activity in the United States [not unlike the Men in Black, whose motto was: "Protecting the earth from the scum of the universe," except that OFM would never use the word "scum"] has decided to exempt foreign diplomats from having to pay U.S. Federal, State and local taxes on tobacco. Given the large number of diplomatic personnel that the U.S. hosts in hundreds of foreign embassies, consulates and UN missions, and the fact that most foreigners smoke like fiends (as experienced travellers can attest), I expect this will cause a significant loss of tax revenue. The only upside of this decision is to "facilitate relations between the United States and foreign governments [and] to improve or maintain the availability of tax exemption privileges for the United States." In other words, we'll make some foreign diplomats happier, and keep open some reciprocal tax loopholes for our own diplomats abroad. Hum. I suspect most U.S. citizens would rather have the cash than the gratitude. After due consideration of the benefits, privileges and immunities provided to missions of the United States under the Vienna Diplomatic and Consular Conventions and other governing treaties, and in order to facilitate relations between the United States and foreign governments, to improve or maintain the availability of tax exemption privileges for the United States, and by virtue of the authority vested in me under the Foreign Missions Act, 22 U.S.C. 4301 et seq., and Delegation of Authority No. 214, Sec. 14, dated September 20, 1994, I hereby designate as a benefit under the Act, to be granted to foreign diplomatic and consular missions and personnel in the United States on the basis of reciprocity and as otherwise determined by the Department, to include personnel of international organizations and missions to such organizations who are otherwise entitled to exemption from direct taxes, exemption from Federal and State or local excise taxes imposed with respect to tobacco products (as defined in 26 U.S.C. 5702) manufactured, packaged or sold in the United States. Procedures governing implementation of this benefit will be established by the Department of the Treasury. DATES: Effective Date: January 28, 2009. Dated: January 14, 2009. Eric J. Boswell, Ambassador, Director of the Office of Foreign Missions and Assistant Secretary for Diplomatic Security, Department of State. An impromptu summit conference on the Darfur crisis took place at the White House yesterday, according to ABC News. President Barack Obama and Vice-President Joseph Biden met with George Clooney, the Special Envoy from Hollywood, and they had a frank exchange of views followed by a fruitful dialog capped off with an assurance of White House support. ABC News' Karen Travers reports: George Clooney met with President Obama and Vice President Biden separately tonight at the White House and they told him they would appoint a full-time, high-level envoy on Darfur that would report directly to the White House, he said. Clooney said that Obama and Biden told him that before the White House can send an envoy, there needs to be a full policy in place on Darfur. Clooney has been an outspoken advocate on the issue of Darfur for several years and has traveled to the region a half dozen times. He was appointed last year as a United Nations Messenger of Peace and is a founder of “Not on Our Watch,” an organization that was started to bring awareness and resources to the conflict in Darfur. Clooney came to the White House tonight to meet with Biden to discuss his trip this month to Eastern Chad, where he visited Darfurian refugee camps with New York Times columnist Nicholas Kristof, and to lobby the Obama administration to make Darfur one of its top foreign policy priorities. “The vice president informed Mr. Clooney about the Administration’s ongoing review of Sudan policy and welcomed his observations from his trip. The vice president thanked Mr. Clooney for his work on this issue, which he believes is an important contribution to the public’s understanding of the conflict in Darfur,” Biden spokeswoman Elizabeth Alexander said. Clooney was not scheduled to meet with Obama, but after running into him, the president invited him to sit down and talk in the Oval Office. Clooney said Obama and Biden both said Darfur is one of several key foreign policies issues on the administration’s agenda. “That’s good to hear because there was some concern this could fall off the radar. As you know there are quite a few other things going on in the world,” Clooney said. During the campaign, Obama frequently spoke out on the Darfur crisis and criticized the Bush Administration for not doing more to prevent and stop genocide there. Around 300,000 people have been killed in the six-year conflict in Darfur and nearly 2.5 million people have been displaced. Clooney said he brought with him to the White House 250,000 postcards signed by people from all across the United States urging the Obama Administration to work to end the crisis in Darfur. I don't yet know how this summit was perceived in the diplomatic community. Bono is traveling in Africa and is unavailable for comment, and Angelina Jolie's spokeswoman did not return my calls. I must say that George Clooney sure does look exactly like an Ambassador should, and looking the part is half-way there in this mass media age. He projects sincerity well, and has just enough grey at the temples to appear distinguished. And he's obviously mastered the patter: "this is high on their agenda" ... "there was some concern this could fall off the radar" ... "one of a small handful of foreign policy reviews being undertaken at the senior most level" ... "it’s not about government money, not about government troops." Why doesn't he just go for it and ask Obama for an appointment? It would not be unprecedented. President Reagan appointed John Gavin, an actor friend, Ambassador to Mexico. I ran into Gavin several times at the embassy and he always appeared impeccably Ambassador-like. But I really saw what skills Gavin brought to the table when he was visiting the construction site of a new consulate office building in Hermosillo. He was wearing a business suit when he arrived at the work site, but then, the instant he spotted a local TV news crew coming down the street, he whipped off his suit coat, rolled up his shirt sleeves, loosened his tie, put on a hardhat, snatched up my sunglasses, and went strolling about pretending to be unaware of the news crew. I realized he had done a costume change in the blink of an eye and was now wearing inspecting-the-construction-site garb that was perfect for unposed action photos. Pro is pro, and he hadn't lost any of his performance abilities even though he hadn't made a movie in ages. Truly, these actors are not to be underestimated. Clooney is old enough and wealthy enough to spend a few years in public service. Who better for Obama to appoint as that promised high-level envoy to Darfur? Or, better yet, appoint him Ambassador to Something or Other. It would be worth it just to see the resume the 'H' Bureau would have to write for his - no doubt fawning - confirmation hearing. The Daily Mail has a story today (here) about the discovery of 38 reels of film that depict parts of Exercise Tiger, the 1944 D-Day practice landings in Southwest England. During the exercise, 946 U.S. soldiers and sailors were killed when German torpedo boats attacked a convoy of landing ships. Secret footage of U.S. soldiers training alongside British troops for D-Day in South-West England have been unearthed from a dusty archive and seen for the first time in 65 years. The 38 reels - lasting ten minutes each - show a variety of images including tanks rolling across beaches and soldiers wading through waves. In another sequence, troops are lined up in make-shift landing barges. 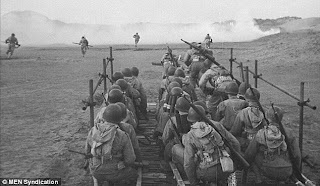 Here's a link to one of the films, which shows troops deploying out of a simulated Higgins Boat landing craft (photo above). Exercise Tiger was one of a number of pre-invasion exercises that took place in April and May of 1944. It took place at Devon's Slapton Beach, which was selected for its similarity to the portion of Normandy's coastline that was assigned to the U.S. Army's 4th Infantry Division in the D-Day invasion and designated "Utah" Beach. The disaster that took place during the exercise was not exactly covered up, but it certainly was officially minimized, due to both official embarrassment and pre-invasion security concerns. The residents of coastal Devon had been relocated inland as a wartime measure so there were really no civilian witnesses, and the casualty statistics from Tiger were not released until August 1944 along with the casualties of the actual D-Day landings themselves. There was little official interest in the whole sad episode after the war was over. There's a good book about the incident (The Forgotten Dead) by the late Ken Small, which describes both the exercise itself and the author's process of discovering and memorializing what had happened at Slapton Beach, a process that began when he became curious about the large number of American military artifacts and personal belongings that he kept finding on and around the beach. The Obama administration hasn't actually appointed any ambassadors yet other than for UN Ambassador Susan Rice, so it's still possible that Obama will appoint no one but stone cold professional diplomats to fill all those vacancies created when the Bush administration's ambassadors were dismissed, just like his admirers in the foreign affairs community (such as here and here) expect he will. But the rumors so far can't be making them happy. Last month it was a Pittsburgh sports owner going to Ireland, now it's Chicago money bundler Louis Susman, the recently retired vice chairman of Citigroup Global Markets, former campaign finance director for Kerry in 2006, and major fundraiser for Obama in 2008, to the United Kingdom's Court of St. James. Barack Obama has been embroiled in a cronyism row after reports that he intends to make Louis Susman, one of his biggest fundraisers, the new US ambassador in London. Mr Susman's reputation for hoovering large amounts of cash from deep pockets saw him nicknamed "the vacuum cleaner" when he raised more than $240 million for John Kerry's White House bid in 2004. He was one of Mr Obama's biggest campaign cash "bundlers", fundraisers who collect contributions from hundreds of others. He also gave $300,000 to the president's inauguration fund. At least Obama is picking a much wealthier political-appointee ambassador than the last one Bush settled for. Robert Tuttle, the US ambassador in London since 2005, was a California car dealer who raised $100,000 for George W Bush's 2004 election campaign and another $100,000 for his inauguration. A car dealer who kicked in only $200,000? He sounds like a piker compared to Louis Susman. Senator Feinstein blurted it out last week, and the Washington Post wrote about it last March, but it looks like it was Google Earth that first told the world the U.S. was flying Predator drones from bases in Pakistan. 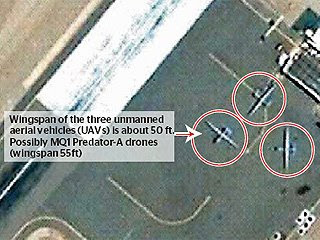 Predator reconnaissance drones were visible in Google Earth images of the Shamsi airbase in Pakistan's southwestern province of Baluchistan as early as 2006, according to the Times of London today (here). The association of falconry with Predator drones is absolutely perfect. Both types of bird glide high in the sky, show great patience as they stalk their prey, employ incredible long-range optics, have human ground controllers, and swoop down very suddenly to take their targets unaware. What could be a better analogy? And what place could be a better base than Shamsi for aerial hunting? King Abdullah bin Abdul Aziz Al Saud of the Kingdom of Saudi Arabia has shaken up the Kingdom's religious establishment by inter alia dismissing Sheikh Ibrahim al-Ghaith as chief of the Commission for the Promotion of Virtue and the Prevention of Vice, which controls the religious police, and replacing him with Sheikh Abdulaziz Al-Hamin (or "Abdul Aziz al-Humain" in al Jazeera's romanising of his name). This was one of a series of personnel changes that King Abdullah has made in the last few days which just might indicate a reformist trend. This week, OpenTheGovernment.Org and the Center for Democracy and Technology launched a project aimed at identifying vital government information and encouraging the federal government to put it within easy reach of the public. This project and survey will lead to a report, recommending documents and data that the federal government should make easier to find and use. The project’s launch follows up on a directive from President Obama to federal agencies to proactively make information available to the public. The goal is to identify the documents and databases the public most wants to be made publicly available in usable formats. The items can be information known or thought to be in the federal government’s possession, or information that the federal government should be collecting or generating. Just go to Show Us the Data before March 9 and vote for your favorites. All the hydrocarbons we could ever possibly use, an Emir's ransom in oil and liquid natural gas, lie unexploited on one of Saturn's moons. It seems like a perfect opportunity for some merger of Exxon and NASA: no oil leases to pay, no environmentalists to deal with, no Saturnian Oil Ministry to pay off, and no critical infrastructure security problems. If only there were some way to haul those resources to Earth, we'd be sitting pretty. But alas, there isn't. The hydrocarbons rain from the sky on the miserable moon [TSB note: it sounds like a lovely place], collecting in vast deposits that form lakes and dunes. This much was known. But now the stuff has been quantified using observations from NASA's Cassini spacecraft. At minus 179 degrees Celsius (minus 290 degrees Fahrenheit), Titan would be an awful place to live. Instead of water, liquid hydrocarbons in the form of methane and ethane are present on the moon's surface, and tholins probably make up its dunes. The term "tholins" was coined by Carl Sagan in 1979 to describe the complex organic molecules at the heart of prebiotic chemistry. Titan has long been viewed as a place that might be somewhat like Earth just before biology got going. Cassini has mapped about 20 percent of Titan's surface with radar. Several hundred lakes and seas have been observed, with each of several dozen estimated to contain more hydrocarbon liquid than Earth's oil and gas reserves, according to a NASA statement. The dark dunes that run along the equator contain a volume of organics several hundred times larger than Earth's coal reserves. Proven reserves of natural gas on Earth total 130 billion tons, enough to provide 300times the amount of energy the entire United States uses annually for residential heating, cooling and lighting, according to the release. Dozens of Titan's lakes individually have the equivalent of at least this much energy in the form of methane and ethane. "This global estimate is based mostly on views of the lakes in the northern polar regions," Lorenz said. "We have assumed the south might be similar, but we really don't yet know how much liquid is there." Cassini's radar has observed the south polar region only once, and only two small lakes were visible. The findings are detailed in the Jan. 29 issue of the journal Geophysical Research Letters. Scientists estimated Titan's lake depth by making some general assumptions based on lakes on Earth. They took the average area and depth of lakes on Earth, taking into account the nearby surroundings, like mountains. On Earth, the lake depth is often 10times less than the height of nearby terrain. "We also know that some lakes are more than 10 meters or so deep because they appear literally pitch-black to the radar. If they were shallow we'd see the bottom, and we don't," Lorenz said. The question of how much liquid is on the surface is an important one because methane is a strong greenhouse gas on Titan as well as on Earth, but there is much more of it on Titan. If all the observed liquid on Titan is methane, it would only last a few million years, because as methane escapes into Titan's atmosphere, it breaks down and escapes into space. If the methane were to run out, Titan could become much colder. Scientists believe that methane might be supplied to the atmosphere by venting from the interior in cryovolcanic eruptions. If so, the amount of methane, and the temperature on Titan, may have fluctuated dramatically in Titan's past. "We are carbon-based life, and understanding how far along the chain of complexity towards life that chemistry can go in an environment like Titan will be important in understanding the origins of life throughout the universe," Lorenz said. It's enough to make my want to write my Congressman and ask whether some of that stimulus money can go to exploring ways and means of bringing that cornucopia of carbons to Earth. Reason magazine has done the spade work for us, so hurry and request your fair share of the economic stimulus money via Reason's Personal Stimulus Generator. Now everyone can be a Beltway Bandit. Palestinian-American journalist Daoud Kuttab had a column a week ago (Palestinians Unsure Which Israeli Leader Will Keep Gaza and the West Bank United) that addressed the politics of the two-state solution in the context of new elections in both the U.S. and Israel. The appointment of the anti-settlements Senator George Mitchell and his decision to open an office in Jerusalem speaks volumes as to what the new Israeli government should expect from the Obama administration. Now that the Israeli elections are over and a hardline government led by the Likud Party is in charge, I expect Daoud foresees a diplomatic clash between the U.S. and Israel in which he assumes the U.S. will naturally have the upper hand. That would be wishful thinking on his part, I'm sure. George Mitchell, the ex-Senator from Maine who became a lobbyist for the tobacco industry, eyeball to eyeball with Bibi Netanyahu, the ex-Sayeret Matkal commando who went on to twice become Prime Minister? I don't see Mitchell winning that contest of wills. Not to mention the Rahm Emanuel factor (see here and here), which shouldn't make the Palestinians happy. How likely is it the new administration will arm-twist the Israelis when Obama's Chief of Staff is the son of Israeli immigrants of a strongly Likudnik bent, and someone so emotionally tied to his parent's homeland that he served as a Volunteer for Israel during the 1991 Gulf War? What is Your Phone Saying About You Behind Your Back? As everyone knows, President Obama still has his Blackberry. I assume all the hoopla that was raised about retaining his BB was really much more about creating an image than it was about communications. However, all that ballyhoo may have served to raise public consciousness about the security risks of our cell phones. Those risks aren't just to privacy, or to our personal information. C-NET has a very nice article illustrating the physical risks that could be created by carrying a Blackberry (or any cell phone). The author is uninformed about the subject and is purely speculating. The president is not carrying off-the-shelf hardware. It is likely relaying through a proxy before communicating with the standard mobile networks, so will not be broadcasting a predictable, unique IMEI. The device may also be using frequency hopping, UWB, or other technologies that make it difficult for intelligence agencies, much less amateurs, to track a signal. That's all very well for Obama, but what about those of us who do carry off-the-shelf cell phone hardware? Do we mind that pretty much anyone, official or otherwise, could track our locations pretty much any time? There is food for thought here. What's more, the same risks of location tracking apply to users of access-control cards, those objects that hang around the necks of about half the U.S. workforce. Those cards have unique identifiers, as do cell phones, and intelligible data is emanated electromagnetically when they are swiped through a reader. That data can be captured at surprisingly long ranges, allowing a high-tech miscreant to track the card user's movements from controlled door to controlled door, or even to forge a card that would work as well as the genuine one. If that is a concern for you, take a look at the countermeasures the article discusses. While in the private sector, I once worked on a problem for a client where the solution was to rotate multiple access control cards among all the client's employees in the same manner the article mentions. In that situation, when employees entered the client's work location through the front door using their coded cards, a hostile observer could match the unique identifier of each card - whose emanations could be read from hundreds of feet away - to the individual employee, and then could track each employee as he used the same card to move around inside that secure work location. Being tracked that way was a problem since some of the employees had to hide their association with a particular work space within the location. So, each employee was issued a deck of access cards, each one uniquely coded, to use on a random basis once inside the front door, thus creating enough confusion to hide their movements. Location tracking is so very easy to do in this age of ubiquitous cell phones, laptops, PDAs, Bluetooth accessories, and access control cards, that we just might want to start thinking about ways to counter it. WHAT did she say? She understands that WHICH kind of drones are flown from bases in WHOSE country? The press is reporting that Senator Diane Feinstein, while chairing a hearing of the Senate Select Committee on Intelligence yesterday, February 12, on the subject of Current and Projected National Security Threats to the United States, had a slip of the tongue. Reporting from Washington -- A senior U.S. lawmaker said Thursday that unmanned CIA Predator aircraft operating in Pakistan are flown from an air base in that country, a revelation likely to embarrass the Pakistani government and complicate its counter-terrorism collaboration with the United States. The basing of the pilotless aircraft in Pakistan suggests a much deeper relationship with the United States on counter-terrorism matters than has been publicly acknowledged. Such an arrangement would be at odds with protests lodged by officials in Islamabad, the capital, and could inflame anti-American sentiment in the country. The CIA declined to comment, but former U.S. intelligence officials, speaking on condition of anonymity because of the sensitivity of the information, confirmed that Feinstein's account was accurate. Philip J. LaVelle, a spokesman for Feinstein, said her comment was based solely on previous news reports that Predators were operated from bases near Islamabad. "We strongly object to Sen. Feinstein's remarks being characterized as anything other than a reference" to an article that appeared last March in the Washington Post, LaVelle said. Feinstein did not refer to newspaper accounts during the hearing. The Senate Intelligence Committee website has a witness statement, but does not make a transcript of the hearing available. You can buy the transcript from FedNews but, hey, what good is the Internet if you can't get stuff like that free? Good old C-SPAN has a for-pay video and transcript page that at least lets you get a glimpse of the transcript gratis. Here's what you can do. If you go to the C-SPAN link you should find a Watch Video box on the right side of the page; in the Search Text box search for "predator;" when a video box pops up, click on Show Transcript. You should see the transcript on the right side of the page, but won't be able to print or download it. Scroll down the transcript and you'll see that at minute 27:45, while asking the witness a question, Senator Feinstein refers to a National Public Radio story of February 3, 2009, concerning the effectiveness of Predator drone strikes in Pakistan. At minute 29:29, while asking a follow-up question, she returns to the topic of Predators and makes the statement: "As I understand it, these are flown out of a Pakistani base." Her spokesman tried to explain that slip away as a reference to Washington Post stories that had already let the cat out of the bag (see here and here). But that explanation doesn't wash. Clearly, she just wasn't thinking and blurted out something she shouldn't have. The crisis continues in the State Department's Office of the Historian, and its Foreign Relations of the United States (FRUS) series. Here's the background. In a public meeting last December, the FRUS Historical Advisory Committee chairman William Roger Louis, a past president of the American History Association, charged State Department Historian Marc Susser with gross mismanagement of the FRUS and called for him to be fired. A review panel was appointed by former Secretary Condoleezza Rice to look into the accusations, and in mid-January the panel produced a very brief - just two pages long - report. That report has now leaked out (see here) just in time for the next public meeting of the FRUS Historical Advisory Committee, which will be held March 2nd. Subtext: The current office management has not demonstrated diplomacy and leadership — i.e., effective management. There is no atmosphere of trust between HO’s management, on the one hand, and HO’s employees and the scholarly community (HAC), on the other. Subtext: Despite the denials of HO management,” the working atmosphere in the office does threaten the FRUS series; simply replacing experienced employees with new ones won’t solve the problem. Subtext: The Historian, whoever it is (and will be), needs to work on morale and trust, preferably with close supervision from above. 4. In point #3, the committee recommends no new hires until a “reorganization” is implemented. Subtext: The committee seems concerned about current management’s hiring practices. Subtext: The Public Affairs Bureau has not been doing its job, either, when it comes to “effective management” of HO. HO clearly needs more effective management from above. 6. “We recommend that there be a careful and supportive study of information security issues in the HO that is designed to generate practical solutions to … information security workplace challenges…. Subtext: The current management’s insistence on labyrinthine security procedures, determined in part by the Historian’s refusal to move the office to more secure facilities, has been creating “challenges” to the completion of their work on FRUS. Subtext: No more making use of administrative loopholes to “purge” HAC members who dare to criticize HO’s performance. 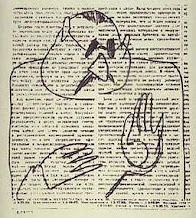 Subtexts: (1) The Historian is responsible for failures in management. (2) “Strong, effective management and leadership are needed” — apparently, they are not present currently. (3) There is a need to “rebuild” a “positive, high-performing team” — i.e., somehow, the previous “high-performing team” was knocked down. In sum, the Review Committee’s report suggests a need for “strong effective management and leadership” in the Historian’s Office — something, which it implies, has not been present. “Whosoever” the Historian will be is an open question, at least as far as the Review Committee is concerned, pending a proposed “reorganization.” Whoever runs HO needs to work on restoring morale and trust within the office because this effects performance on the FRUS series. Sounds like a thorough indictment of HO’s current management to me. It sounds like that to me, too. I'm reserving my seat early for the March 2nd meeting, and I might bring popcorn. Presidential Determination No. 2009-15 of January 27, 2009 (Unexpected Urgent Refugee and Migration Needs Related To Gaza) finds that it is in the U.S. national interest to send $20 million and change to meet the "humanitarian needs of Palestinian refugees and conflict victims in Gaza." How or whether the recipients are screened to prevent this money from going to HAMAS entities is anyone's guess. By the authority vested in me by the Constitution and the laws of the United States, including section 2(c)(1) of the Migration and Refugee Assistance Act of 1962 (the ``Act''), as amended (22 U.S.C. 2601), I hereby determine, pursuant to section 2(c)(1) of the Act, that it is important to the national interest to furnish assistance under the Act in an amount not to exceed $20.3 million from the United States Emergency Refugee and Migration Assistance Fund for the purpose of meeting unexpected and urgent refugee and migration needs, including by contributions to international, governmental, and nongovernmental organizations and payment of administrative expenses of Bureau of Population, Refugees, and Migration of the Department of State, related to humanitarian needs of Palestinian refugees and conflict victims in Gaza. You are authorized and directed to publish this memorandum in the Federal Register. According to the Overseas Vote Foundation, roughly half of overseas and military absentee voters may not have gotten their ballots counted in the last election. The main problem was the delay in transmitting paper documents via traditional mail, as is required by Federal and state election procedures. Although local election officials reported increased interest from overseas and military voters for the 2008 elections, 22 percent of those who requested ballots did not receive them, and another 40 percent received ballots too late to be sure they could be returned in time to be counted, a survey said. Those are among the findings of a post-election survey of more than 24,000 overseas and military voters conducted by the Overseas Vote Foundation. Overseas civilians and military personnel and their families are entitled to vote in U.S. elections under the Uniformed Overseas Citizens Absentee Voting Act (UOCAVA), but these voters often have been disenfranchised because of delays in receiving and casting absentee ballots by traditional mail for local and federal elections. A recurring theme in voter problems was the length of time it takes for paper documents to pass between voters and election officials by traditional mail. There are risks to the electronic transmission of ballots, however, when the traditional snail mail system results in disenfranchising maybe half of all overseas and military voters, how much worse could a new system be?. Posted on USAJobs today: the U.S. State Department is hiring Foreign Service Security Protective Specialists on five-year contracts to handle the high-threat personal protection jobs that have been performed mostly by contractors up to this point. The Department of State, Bureau of Diplomatic Security (DS), is seeking highly qualified and motivated men and women with extensive experience in protective security operations to serve as Foreign Service Security Protective Specialists at certain U.S. Embassies, Consulates and regional offices abroad. This workforce will be deployed to Iraq, Afghanistan and Israel, and possibly other Foreign Service posts, to supplement DS Special agents in the supervision of contractor personnel. The specific number to be hired will depend on the needs of the Foreign Service. As members of a diplomatic team, Security Protective Specialists (SPS) not only help to accomplish the mission of the Department of State but also represent the United States to the people of other nations. DS will create SPS positions initially at the following locations: Embassy Baghdad; Iraq Regional Embassy Offices Erbil, Al Hillah, Tallil and Basra; Embassy Kabul and Consulate General Jerusalem. SPSs will work in tandem with DS Special Agents (SA) to ensure that a DS supervisor is always present and involved with every protective motorcade element. The SPS or SA may act as the Detail Leader and may supervise other DS or contractor personnel. Appointment as a Security Protective Specialist will be in the Limited Non-Career Appointment category. This category is based upon an annually renewable appointment with a 5-year maximum. Extensions beyond five years are not permitted. At the conclusion of the appointment, SPSs may apply for any Department position for which they are qualified, to include the Special Agent position. Federal retirement benefits accrue during time spent as a DS Security Protective Specialist. All assignments will be at the needs of the service. After the initial tour, SPSs may be transferred to other high threat posts overseas for two consecutive 2-year tours of duty. There is no provision for election of post of assignment. A limited, non-career appointment to the Foreign Service involves uncommon commitments and occasional hardships along with unique rewards and opportunities. A decision to accept such an appointment must involve unusual motivation and a firm dedication to public service. The overseas posts to which SPSs will be assigned may expose the employee to harsh climates, health hazards, and other discomforts and where American-style amenities may be unavailable. Assignments to Iraq, Afghanistan and Israel are particularly challenging and may result in bodily injury and death. However, a limited appointment to the Foreign Service offers special rewards, including the pride and satisfaction of representing the United States and protecting U. S. interests at home and abroad. As Personal Service Contractors, the protection specialists will be direct government employees and therefore much easier to manage and discipline than private contractors. The need for lots of protection specialists at high-threat diplomatic posts might go away someday, but not someday soon, so I think State is doing the right thing by bringing the knuckle draggers (and I use that term with affectionate regard) in-house in order to get them under better control. State can still bring on more private contractors as necessary for short-term surges. I suspect this will be an attractive opportunity for many private contractors, especially those who are younger and want to turn the PSC job into a full time gig later on with accrual of retirement benefits for time spent as a PSC. The Washington Post reports that National Intelligence Director Dennis Blair has offered former CIA Director John Deutch a position on an advisory panel on spy satellites. Deutch, CIA director from May 1995 to December 1996 in the Clinton administration, stored and processed hundreds of files of highly classified material on unprotected home computers that he and family members also used to connect to the Internet, according to an internal CIA investigation. The Defense Department's inspector general found similar conduct during Deutch's prior service at the Pentagon. My heart goes out to the poor slob who has to be responsible for IT security for an advisory panel that includes Mr. Deutch. His Arabic name is romanised as "Mu'ammar Al-Qadhafi," according to the U.S. Department of State, but other organizations tranliterate it in different ways. Many different ways. The U.S. Library of Congress lists 53 variations on the spelling of his name (see below). But I have just discovered the true spelling direct from the clotheshorse's mouth. It turns out he is actually Brother Leader "Al Gathafi," and he has lots of weighty things to say at Al Gathafi Speaks. 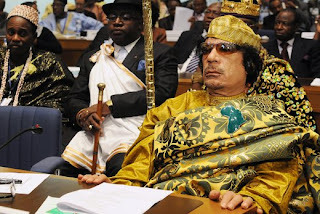 Muammar Qaddafi has always been a fashion-forward kind of dictator, but from the looks of that ensemble he was wearing on the occasion of his installation as Chairman of the African Union, he's now taken Third World Leader Style to a whole new level. That golden brocade man-dress he's wearing is stunning. And that wrap with the emerald brooch in the shape of Africa, that cap at exactly the right jaunty angle, and the killer sunglasses? It's all absolutely perfect. 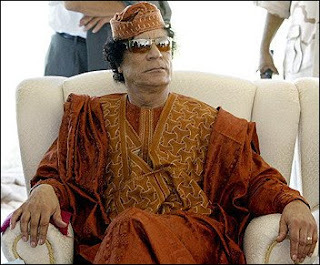 Who other than Qaddafi could pull off that look? Nobody. He's left even President Hamid Karzai behind in his voguish dust. Yesterday's LA Times story about the new administration's policy on rendition of terrorists (Obama preserves renditions as counter-terrorism tool) has many commentators riled up, even though there might not be all that much to the new policy once you consider the distinction between "extraordinary rendition" - which was conducted under the Bush administration - and the ordinary kind of rendition which will still be permitted under Obama. The really interesting thing to me is how many different meanings for "render" I found in Websters Dictionary. The word may refer to actions in the visual arts, or computer science, or food processing, or in law. But it may also mean "to apply a coat of plaster or cement directly to" an object, as is often done to ceilings and walls for construction purposes.